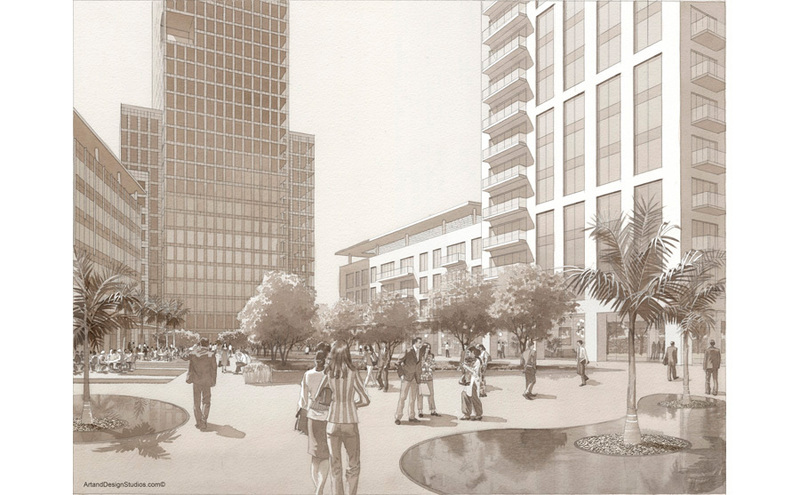 Sepia illustration of Vatica One India Next mixed-use commercial/residential development in Gurgaon. Monochrome watercolor technique. "…Gurgaon is arguably the fastest growing real estate market in India. … The growth of Gurgaon has been driven by the corporate sector. Many of the world’s best-known multinational corporations have chosen Gurgaon as their headquarters in India, and their top executives have chosen it as their home. The cosmopolitan nature of Gurgaon is reflected in the city’s residents, markets, shop shelves, restaurants, schools and entertainment centres. The city of Gurgaon indeed has the highest density of schools and hospitals in India, as well as the third highest per capita income. In all of India, Gurgaon stands apart as a world city. One India Next has an excellent location in Gurgaon’s largest commercial belt, with a direct frontage on NH-8. At the same time, it is also a part of Vatika India Next – and the way it is envisaged perfectly complements the unique location. Instead of the typical ‘enclosed building’, One India Next will be a large, open piazza with shops, restaurants and offices in the buildings ranged around."